I didn't make these items, but I love them so much I wanted to share them with the rest of the world. I love this apron, because it is so me! Not only it is girly and sweet loking but it is sarcastic and shoe loving just like me. "Will Cook for Shoes" is inscribed on a pink and white striped apron along with images of shoes. At the bottom it says "lots and lots of shoes." One size fits most and measures approx. 29" x 30". black and white polka dot pockets and trim, a pale pink apron declares "Born to Shop–Forced to Cook." Wear it while you cook, or when you are taking the to-go food from the carton and plating it like a good Domestic Goddess. For all of you who like to cook with wine, this is the apron for you. A hot pink apron is bordered in zebra stripes, has a zebra-print pocket and reads "My Favorite Kitchen Utensil:" with a picture of a corkscrew below. Self Cleaning—"This is a self cleaning kitchen, so clean up after yourself." This is perfect for us goddesses who hate cleaning the kitchen.Each set includes a tempered glass cutting board that won't harbor bacteria and is resistant to stains and odor. It wipes clean and is great for pastry; measures 15-3/4" x 11-3/4". Comes with a matching flour sack-style dish towel (19-3/4" x 27-1/2"). The cotton towel is machine washable and imported. No Boys Allowed Serveware sure to liven up your party. 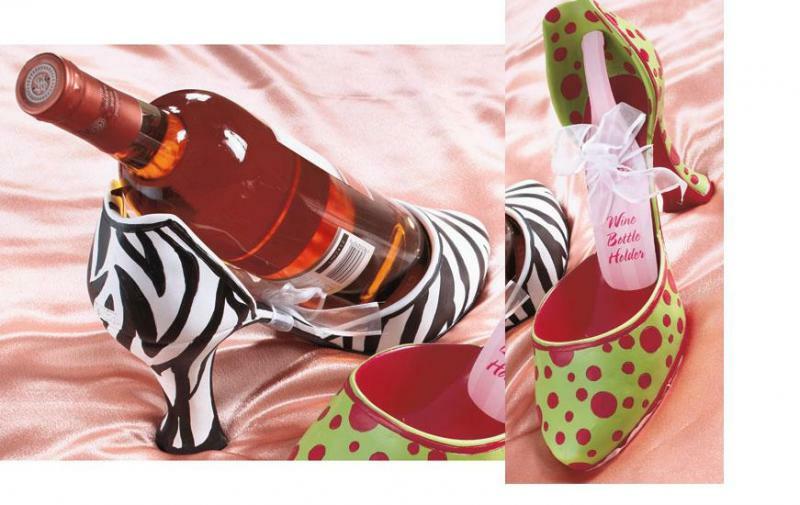 Sure to create a buzz among your friends, the shoe-shaped Wine Bottle Holders are designed to comfortably cradle your favorite vintage and coordinate perfectly with the plates and napkins. Each measures 12" x 7" x 4"; made of cold cast ceramic. Find more items such as these on my Facebook page. Copyright 2010 Elsie The Domestic Goddess. All rights reserved. !